Channel Islands, Isle of Man, Isle of Scilly, Isle of Wight, Scottish Isles, Scottish Highlands and N.Ireland, Republic of Ireland. Solar Powered. Solar panel: 2V 40mA. Solar powered LED light. Size of Solar Panel: 4.7 x 4CM Approx. · Easy installation - no wires required; simply screw them on the surface. (Screws included). Includes Rechargable Batteries. Brightens up any garden. Bulb type: LED. Solar Path Lights to light up your pathway, for visibility and decoration. 10 x Solar Pathway lights(white). Very stylish when turned on at night, this solar light is suitable for use in garden, lawn, villa, park, or yard at no power cost, no wiring required and simple assembly. Stake, deck and wall / fence fixing options. Thea Solar Garden Spotlight. It was given full marks for features, performance and value and was awarded best buy. See 26th of July 2014 issue for further details. On / Off switch to override this if required. Looking for an easy way to enhance an outdoor setting?. The Canterbury Solar Wall Light does this and more with an elegant glow emitted from the white diffuser and simple installation in under 10 minutes. Adoption of high quality material, the string lights are durable and excellent in waterproof performance. - Easy to Install & Operate - Ground stake provided for you to set up the solar panel, 2 switch buttons, Power ON/OFF. Victorian Wall Light. Solar powered. For outdoor use - weatherproof. wire free installation, easily fit to any external wall. Bright white LED bulb. As it is solar powered there is no wiring to worry about. Simply ensure that it is placed in an area of direct sunlight. When darkness falls, the centre sections will light up automatically and will stay on through the night making them perfect for use to highlight doorways etc. Overall height (not including ground spike): 24.5cm. When powered "on" these solar lights automatically switch on in the evening and off again in the morning when it gets light. LED light for brighter output. Solar Powered Security PIR Sensor Spotlight. 3 different light modes including sensor mode, dim mode and bright mode. tech solar panel. high quality solar panel. Solar panel: 4V 0.33W. Ideal for entrances, garden fences, sheds,pathways, gates, garages and any other dark areas. 6x Solar Charging LED Flood Light. · LED Type: Flood light. · The Solar Light LEDs are more durable than conventional glass light bulbs and are more efficient. · 2 or 3 LEDs in each light can provide up to 5-6 hours of lighting on a 4.5 hours' solar charging. And Use It To Power The Long Life, Super Bright Led Lights When It Is Dark. When Switched "On" These Solar Lights. Solar Powered. Stainless Steel. Automatically Switch Themselves On In The Evening And Off Again In The Morning When It Gets Light. Set of 6 solar powered colour changing diamond stake lights. No wiring required - install anywhere in the garden. Light turns on automatically when dark. Cash when collecting. We accept all major debit and credit cards. Perfect for outdoor use. 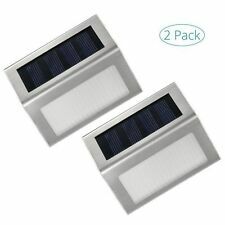 Fast & Easy Installation : simply screw it onto the surface of any wall (Screws included) and easy to maintain with detachable solar panel and LED Lamp body to the supporting cover. ● PIR (Motion) detection angle and distance: 120°, 10 FT. Excellent illumination: It turn the dark space into a bright lighted one, which is a perfect choice to be used in garden, fence, patio, deck, yard, driveway, stairs, outside wall etc. Condition is New. The lights are from a house clearance, Still boxed and wrapped and never used. Hanging Solar Ball Crackle Bulb Lights Outdoor Garden Party Ambience. Efficient Integrated Solar Panels. Electricity: Solar. Integrated solar panel: 2V / 60MA. These lights have been constructed from high-quality stainless steel, making them non-corrosive and rustproof. Grande taille... massif hauteur 30cm!!! le moins cher sur ebay! When switched "on" the solar lights will automatically switch on in the evening and off again in the morning. Solar powered. 8 solar panels for more efficient charging. Bright white LED light. Corrosion proof stainless steel construction. Bubble ball light is completely powered by the sun Automatically darkens during the day and brightens at night Length: 30leds lamp distance 15CM, lead 2M, total 6.5M. Colour: Cool White Solar panel: 2V / 100MA Battery: 1.2V 30LED: 600MA Charging: 4-8 hours discharge: 8-20 hours. Product Size: D61mm H265mm. Battery 1 AA NI-MH 600mAh, 1.2V, Solar Panel: 2V 45mA. Lamp: 3 White LED, Illuminates for 8-10 hours. Available with Butterfly or Rose design. We will always do our best to resolve any issues. Decorate and beautify your garden with this set of 2 solar glass lantern. Features a rope handle that enables you to easily hang the light from branches, patio, balconies and verandas. 2 piece Yellow glass solar lantern. These Solar Powered Gutter Lights use LED bulbs for brighter output and are ideal for any fence or gutter around the home or garden. to light up dark paths etc or simply for decoration. They are charged by the sun's light during the day and built-in sensor turns the lamps on at night and off during hours of daylight so they have time to charge up using the sun's natural energy. They are very easy to install and are supplied with mounting brackets. These are suitable for mounting the lights onto either fences or gutters. The batteries are fitted internally into the lamps so no wiring or electrical knowledge is required. Ideal for areas where a conventional electrical supply is not available. Specifications This gutter light is manufactured with a solar panel. 6 super white LED bulbs. Decorate and beautify your garden with this solar powered Flame LED light. Automatically turns on at dusk. No wirings needed so it can be installed anywhere in your garden. Uses 1 x Colour changing LED. Includes a rechargeable 1 x AA battery and an On/Off switch. Product Dimensions: Approx. 8 x 8 x 42cm. Powered by frooition All Items See our eBay store for more great items >> Shop Categories Check out my other listings My ProfileSee More Items... 3 X STYLISH ORNAMENTAL ACRYLIC BRANCH TREE LEAF SOLAR OUTDOOR GARDEN LED LIGHTS Item Description These Brushed Stainless Steel Solar Powered LED Garden Lights from Garden Mile® are ideal for patios, paths, borders, ponds and driveways. They convert energy from the sun during the day into electricity, at no cost. It features 60 Ultra Bright SMD LEDs in a weatherproof PVC plastic casing. Simply choose a location you desire to mount the solar panel and light with the included mounting hardware to be done within minutes.